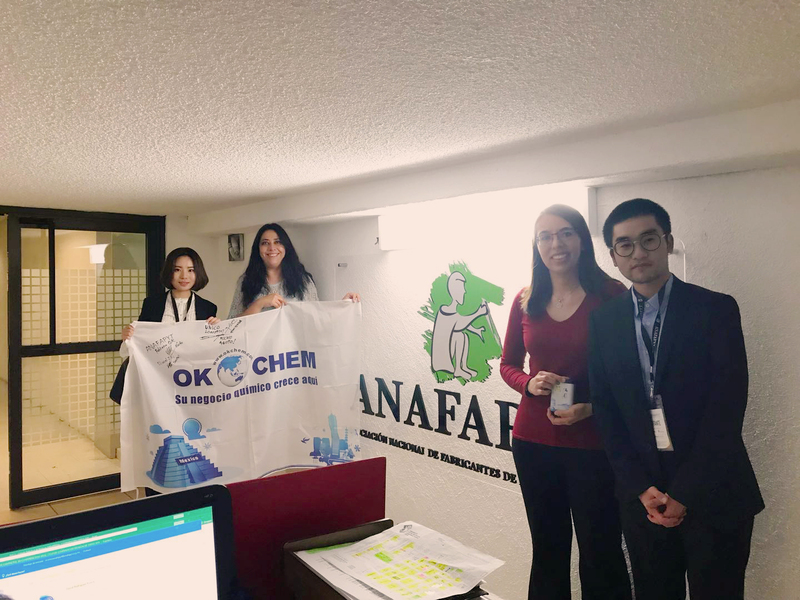 Last week, OKCHEM team in Mexico visited Asociación Nacional de Fabricantes de Pinturas y Tintas (ANAFAPYT ) in the Mexico City, in order to help the buyers and suppliers on OKCHEM to have a better understanding about the local coating market and get more business opportunities in Mexico. Established in 1944, ANAFAPYT is one of the most important organizations in Mexican coating industry with a history of about 75 years. It is also a member of Federación Latinoamericana de Asociaciones de Técnicos y Fabricantes de Pinturas y Tintas (LATINPIN), which has a great influence in the all South America. With the goal to integrate the domestic and international resources and enhance the efficiency of the coating industry, ANAFAPYT is well renowned in Mexico and the South America, and has gathered the most resources in the industry. Besides the Mexico City, it also has offices in Guadalajara and Monterrey. Though ANAFAPYT is a big organization in Mexico, this is the first time a Chinese company visited them. In this visit, our OKCHEM team in Mexico visited Mrs. Adriana Ortiz Keinrad, the director of public relations, and Mrs. Mariel Zerecero Navarro, the director of website and magazine services and had a cheerful conversation with them. They were quite impressed with our chemical B2B platform, and said it was an innovative invention because they did not have any website like OKCHEM yet, and such a platform would be very helpful to connect the buyers and suppliers. Mrs. Adriana Ortiz Keinrad also provided us many useful information in order to strengthen the cooperation of coating industry between China and Mexico. In the future, both of our parties will continue to cooperate in many different aspects to promote the chemical industry development in today’s world. We believe with our localized efforts in the Mexican market, we would have better and deeper understanding about the local markets of different chemical fields. And we are more confident to realize our mission and help the buyers and sellers to grow business on OKCHEM. Either you are a supplier or buyer, if you want to do business with those companies from South America, join us now ! We can provide the most reliable solutions to help you grow in this growing market.